Industry application: Wood work, Advertising Sign&Mark, Acrylic Cutting, Advertising plate, Led Lamp. Applicable material: Wood, Aluminum sheet, aluminum composite panel, dual-color plate, Mdf, Cristal plate, artifical marble and other metal and non-metal materials. 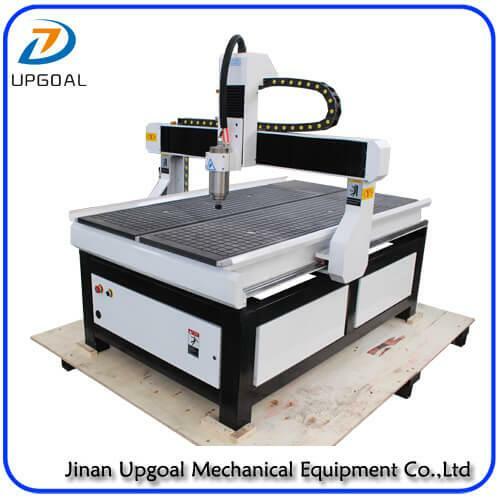 Working Method: 3D embossment engraving, 2D engraing and Cutting, Bottom Milling. 1.Cast iron lathe bed. Stable Running with less Vibration. 2.With Gantry moving type, stable and durable for long time using. Ensure high positioning accuracy. 3.Vacuum adsorption system with 5.5kw air cooling vacuum pump, vacuum table which is divided into 4 zones,can adsorb different size materiel from small to big, saving materials load-unloaded time. 4.XYZ three axis are with linear square guide rail, Hiwin, Taiwan. Ball screws transmission for all axis. Durable running with Higher accuracy. 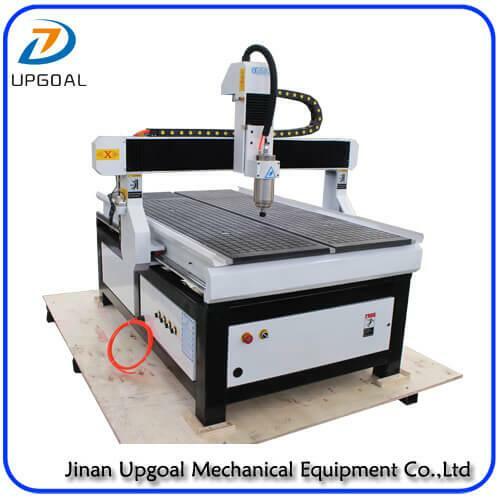 5.Large Power 3.2kw water cooling spindle which is applicable not only for cooper plate, aluminum plate, iron plate engraving but also for wood working. 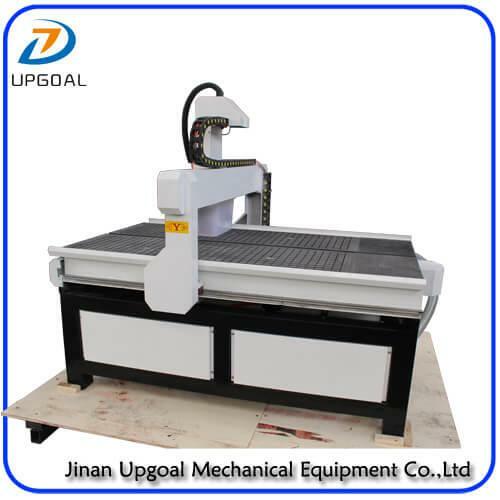 It can cut 20-30mm thickness acrylic by one time cutting. 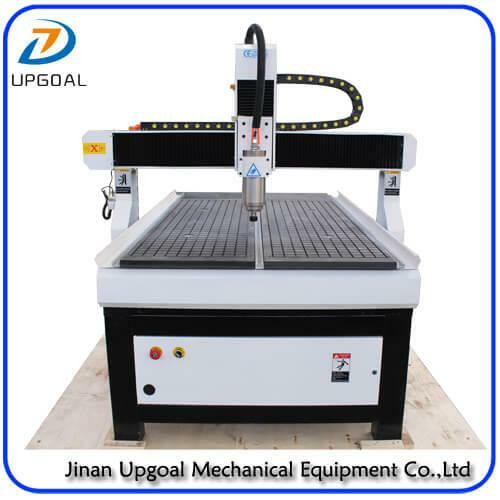 The fine engraving is more smoothly and clear by large power spindle. 6.Dust-Proof design for XZ-axis, protect the guide rail and ball screws from the Dust&Dirt, help to ensure machine working performance. 7. China powerful 86BYGH450A stepper motor and Leadshine DMA860H driver for XYZ-axis, faster speed and high precision working, and not easy to loss steps. 8.Mach3 control system, with USB port for desktop or laptop computer, showing the processing path , more convenient. 9.Rationalized placement of the electronic parts. Optimized heat dissipation effect. Adopt high quality electronic parts, minimizing fault rate, Adopt high flexible cable and imported electronic parts, electrical design of whole machine is complied with the CE standard. 10.With the function of break-point memory, power failure resuming and automatic home/origin correction function.The Working can be resumed after unexpected situations or next day.effectively ensure long time working precision. 11. Working Pause, Speed adjust, Working depth adjust at any time while working. Preview the 2D&3D working result With simulation function. Variable Speed is suitable for various materials and industry. 13. Auto tools calibration fucntion, convenient for the operation.